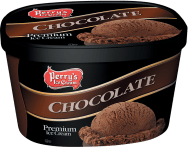 Just when you thought chocolate couldn’t get any better, there’s Perry’s chocolate ice cream. An absolute classic. MILK, CREAM, LIQUID SUGAR, SKIM MILK, BUTTERMILK, WATER, CORN SYRUP, MILKFAT, COCOA (PROCESSED WITH ALKALI), WHEY, CHOCOLATE LIQUOR, MONO- AND DIGLYCERIDES, CELLULOSE GUM, GUAR GUM, CARRAGEENAN, DEXTROSE.